Baltimore City’s at-risk youth often face complex challenges both at home and in school. Tune into MPT for a compelling conversation featuring local youth that overcame almost insurmountable obstacles to stay in school and succeed. To get an up-close look at the issues at-risk youth face, MPT partnered with Wide Angle Youth Media, a local non-profit organization that teaches youth valuable media skills in order to produce their own empowering autobiographical stories. These video stories are available for viewing online and woven into the program. Viewers will also hear from community organizations and American Graduate Champions that provide invaluable hope and help to Baltimore’s at-risk youth. 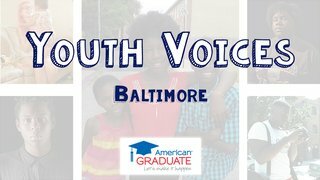 Youth Voices Baltimore is part of MPT's American Graduate initiative, focused on raising awareness around the high school dropout crisis, and is supported by the Corporation for Public Broadcasting. * To watch the entire community conversation, including a thought-provoking Q & A, please access the video at the top of this page. Join the conversation on Twitter! #AmGradMPT. For resources to help at-risk youth, visit MPT's American Graduate site or AmericanGraduate.org.